Do you really want to be completely off the grid? Really? Not even a local SIM card for emergency situations? You might be one of those that wants to disconnect completely: no phone calls, no mail. That’s okay, but assume you want to have some kind of back-up in case you do need to contact someone. You might want to simply check in the albergue/hostel in the next village if they have a free room to decide whether you’ll walk the extra mile or not. Or maybe you met a very nice pilgrim and you decide to meet up again once in Santiago to have a nice dinner together. These are local calling needs. Being able to have access to modern ways of communication on the Camino can make the experience a lot more comfy! You might also have promised to keep regular contact with your family and friends at home. This involves international calls. On this page you will find our advice to keep communication on the camino as cost-effective as possible. 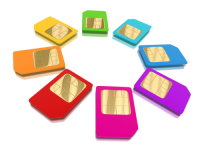 Assuming you are taking your smart phone with you and that it is unlocked, a local SIM card (prepaid) is your cheapest option. You will be using your own device to communicate on social media and with the folks back home: OVER Wi-Fi whenever you get the chance (which usually is every morning and evening in the albergues/hostels and during the day in most bars and cafe’s you’ll encounter). If there is an emergency and you need to call home, obviously the rate and roaming charges will not be imperative in your decision to call or not: it’s an emergency. Don’t forget that you can keep contact with your loved ones and other pilgrims on the way via apps like Whatsapp or FB’s Messenger. So don’t put too much emphasis on the ‘calling’, better to have more G’s of roaming :-). Last but not least, for our non-European pilgrims: roaming costs have been harmonized in the EU since June 2017 :-). Go to a provider store (there are several of them usually, even in smaller cities). You might even decide to do this already at arrival in the airport. Ask for advice to buy a local SIM (Necesito una tarjeta de prepago, cuales son los planes?) [I need a local SIM card, what are your plans?]. They will show you their plans. Pick one according to your budget and you’ll be set up in a couple of minutes. You’ll need to show your passport/ID since registering pre-paid SIM cards is mandatory by law in Europe. For about 15 Euros you’ll have usually at least 1GB of data and about 60 minutes of national calls. Orange often offers even double data plans during the summer (check their site). Don’t get carried away with the data plan though: you should be using Wi-Fi as much as you can (especially for Skype video calls). A 1GB plan should be really enough to roam the internet looking for nearby hostels, communication via Whatsapp or FB messenger (or whatever services you usually use) during your walks in areas where they don’t have Wi-Fi. For instant communication with your local friends and fellow-pilgrims or with that nearby hostel to check availability, you can give them a local call and 60 minutes will be probably enough for 14 days. If you are staying in Spain for a long period of time, topping-up your SIM card with an additional amount is easy: you go to an ATM and follow the instructions on screen. You can also call a certain number (ask your provider when you buy the SIM) or do it online on the provider’s website. The easiest way though: you go to a provider shop, give them money and they’ll top it up for you: ‘Buenas, me recarga la tarjeta por favor?’ [Hello, would you be so kind to top up my card]? That’s all it takes! Now you can call, blog, surf and have the very comfortable idea of not receiving a huge phone bill from your provider once you get home!